Dying Earth is a subgenre of science fantasy or science fiction which takes place in the far future at either the end of life on Earth or the End of Time, when the laws of the universe themselves fail. Themes of world-weariness, innocence (wounded or otherwise), idealism, entropy, (permanent) exhaustion/depletion of many or all resources (such as soil nutrients), and the hope of renewal tend to dominate. The Dying Earth genre differs from the apocalyptic subgenre in that it deals not with catastrophic destruction, but with entropic exhaustion of the Earth. The genre was prefigured by the works of the Romantic movement. Jean-Baptiste Cousin de Grainville's Le Dernier Homme (1805) narrates the tale of Omegarus, the Last Man on Earth. It is a bleak vision of the future when the Earth has become totally sterile. Lord Byron's poem "Darkness" (1816) shows Earth after the Sun has died. Another early example is La Fin du Monde (The End of the World, aka Omega: the last days of the world), written by Camille Flammarion and published in France in 1893. The first half of the novel deals with a comet on a collision course with earth in the 25th century. The last half focuses on Earth's future history, where civilizations rise and fall, humans evolve, and finally Earth ends as an old, dying, and barren planet. Another early and more famous science fiction work to utilize the familiar Dying Earth imagery was H. G. Wells's famous novella The Time Machine (1895). At the end of this work, the unnamed time traveller travels into the far future, where there are only a few living things on a dying Earth. He then returns to his own time to relate his tale to a circle of contemporaries. Two brooding works by William Hope Hodgson would elaborate on Wells's vision. The House on the Borderland (1908) takes place in a house besieged by unearthly forces. The narrator then travels (without explanation and perhaps psychically) into a distant future in which humanity has died and then even further, past the death of Earth. Hodgson's The Night Land (1912) describes a time, millions of years in the future, when the Sun has gone dark. The last few millions of the human race are gathered together in a gigantic metal pyramid, the Last Redoubt (probably the first arcology in literature), under siege from unknown forces and Powers outside in the dark. A work by the early French science fiction author J.-H. Rosny aîné, La Mort de la Terre (1910), deals with the last, scattered generation of an evolved humankind on an exhausted, desert earth and their encounter with a new type of mineral-metallic life. In some ways it reads like the inversion of his earlier Les Xipéhuz (1887), in which early humans encounter and battle an utterly alien and incomprehensible form of life. Zothique, vaguely suggested by Theosophic theories about past and future continents, is the last inhabited continent of earth. The continents of our present cycle have sunken, perhaps several times. Some have remained submerged; others have re-risen, partially, and re-arranged themselves. The science and machinery of our present civilization have long been forgotten, together with our present religions. But many gods are worshipped; and sorcery and demonism prevail again as in ancient days. Oars and sails alone are used by mariners. There are no fire-arms—only the bows, arrows, swords, javelins, etc. of antiquity. Although not technically set on a dying Earth, many of the sword and planet stories of the early twentieth century set on Mars—most notably Edgar Rice Burroughs's Barsoom series and works influenced by it, such as the Eric John Stark stories of Leigh Brackett and C.L. Moore's series focusing on Northwest Smith—share similarities with the genre. In these stories, ancient and exotic Martian (or other) civilizations have undergone a decadent decline, enlivened by the presence of demonic adversaries from past ages. The fact that scientists had seriously speculated that Mars had once borne life, which had by the present almost or, perhaps entirely, died out, gave a special entropic kick to these escapist adventures. H. P. Lovecraft and Robert H. Barlow — "Till A’the Seas" (1935) is a tale of the slow fading of human civilization and the extinction of all life on Earth, as the planet became a desert under the sun that has expanded into a red giant. The story centers on a male protagonist named Ull, the last of his tribe, and his journey across lands and abandoned cities in hopes of finding water, shelter and other survivors. Don A. Stuart — Night (1935). Short story. As an unexpected side effect from an experimental anti-gravity device, a test pilot is sent countless billions of years into the future. The Milky Way has been reduced to less than a light-year in diameter, and the dead Earth is tidally locked to a much larger and colder red sun. All the gas in the atmosphere, except for neon and helium, is frozen solid. A huge city contains the frozen remains of humans, and the machines humanity had perfected are dead due to the superconductivity caused by the cold. Edmond Hamilton — The City at World's End (1951) and the comic book story "Superman Under the Red Sun" from Action Comics #300 (1963). Arthur C. Clarke — The City and the Stars (1956), a revision and expansion of the earlier novella "Against the Fall of Night". John Brunner — Catch a Falling Star, an extended version of The 100th Millennium, first published as "Earth is But a Star" (1958) which features in the Broderick anthology, (2001, below). An early example of a far future tale influenced by Vance. Brian Aldiss — Hothouse (1962, also known as The Long Afternoon of Earth). The earth has locked rotation with the sun that has increased output, and plants are engaged in a constant frenzy of growth and decay, like a tropical forest enhanced a thousandfold; a few small groups of humans still live, on the edge of extinction, beneath the giant banyan tree that covers the entire day side of the earth. Poul Anderson — Epilogue (1962). A novella about a starship from earth on its way to a new solar system, but which due to malfunction returns to its original solar system again three billion years into the future. The sun has become a red giant, and life on earth has been replaced by cybernetic organisms, descendants of human technology. Lin Carter — Giant of World's End (1969), and following prequels. Sword and sorcery fantasy novels set on a decadent far-future Earth in which all the world's land masses have supposedly drifted back together to form a last supercontinent called Gondwane. C. J. Cherryh — Sunfall (1977-2004), a collection of short stories set in various locations on Earth in the far future. The tone, themes and fantasy conventions employed in this collection differ by story. (These were reprinted in The Collected Short Fiction of C. J. Cherryh ). Doris Piserchia — Earthchild (1977), in which the last human being on Earth faces competition from the world-spanning alien creatures that have devastated the planet. George R.R. Martin — Dying of the Light (1977), a novel set on Worlorn, a world whose course is taking it into the far reaches of space, where all life on the planet will die. Philip Jose Farmer — In Dark Is the Sun (1979) a tribesman from the distant future quests across the landscape of a dying earth. As with much of "Dying Earth" science fiction, this text ruminates on the nature of ending, and the meaning of time itself. Gene Wolfe — The Book of the New Sun (1981–3) chronicles the journey of a disgraced torturer named Severian to the highest position in the land. Severian, who claims to have a perfect memory, tells the story in first person. The Book takes place in the distant future, where the sun has dimmed considerably. 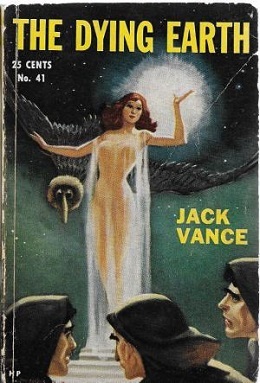 Wolfe has stated that Vance's series directly influenced this work. The Book has several associated volumes. Darrell Schweitzer — The Shattered Goddess (1983), fantasy novel set at the end of man's dominion over Earth, in the interval between the death of the last deity of the former age and the rise of the first of the new. Followed by Echoes of the Goddess (2013), a prequel short story collection. Michael Shea — Nifft the Lean (1982), a series of sword and sorcery tales set in a far future age where demons and alien entities vie for dominion over the Earth. A later story set in the same universe involved a mash up with Vance's Cugel the Clever. Damien Broderick, ed. — Earth is But a Star: Excursions through Science Fiction to the Far Future (2001), an anthology of canonical dying Earth short stories mostly set on Earth in the far future, interwoven with specially commissioned critical essays on the dying Earth theme. Greg Bear — City at the End of Time (2008), a novel that is a homage to William Hope Hodgson's The Night Land . Rick Remender — Low (2014), a comic series set billions of year in the future where the rapid expansion of the sun forces humanity to live under water. The Night Land- A website about "The Night Land" by William Hope Hodgson, includes also original fiction set in his universe, with influences of Cordwainer Smith and others Dying Earth authors.